Saturday was over, a short nights sleep and we were back in Catterick for the Sunday. Next up were Libby B, Lulu and Katie and another day of Wetherby spirit. Solid and enjoyable floor performances set us off again with a 9th place (Lulu) secured. Nerves got the better of one of our number for a short while, but team support meant that performances didn’t suffer with a 10th place on this piece (Katie) and Lulu and Libby only outside of the top 10 by 0.2 and 0.3 respectively. Once through range and vault we were all back on form. Bars were neat, tidy and consistent with all 3 gymnasts achieving scores that were knocking on the door of the top 10 on this piece. This left beam to go and the free roll! Libby and Lulu got their feet on but couldn’t quite keep their balance and took falls. Katie lost momentum and struggled to stand but fought until she made it to her feet and stayed on. 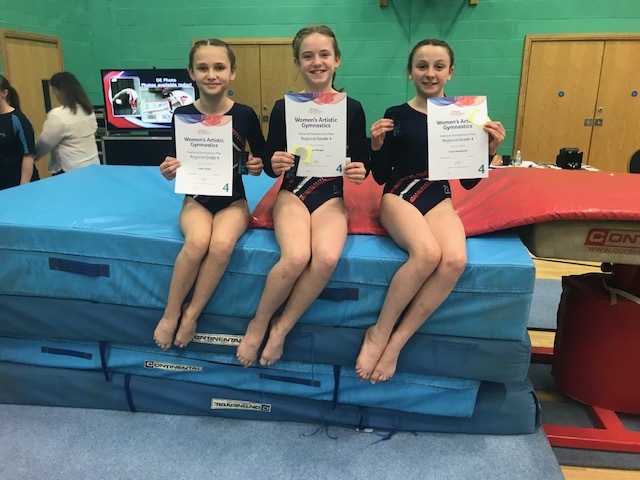 However the free roll wasn’t allowed to affect the rest of the performances and the routines were performed determinedly to the end of beam and the competition securing commendations for all three gymnasts.